Our product range includes a wide range of upvc pipe 1/2" sch 40, upvc pipe 3/4" sch 40, upvc pipe 1" sch 40, upvc pipe 1.1/4" sch 40, upvc pipe 1.1/2" sch 40 and upvc pipe 2" sch 40. 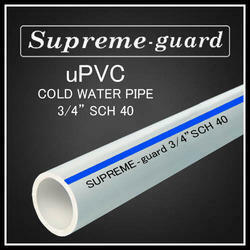 We have an exclusive range of Supreme 3/4" Inch UPVC Pipes SCH 40 that is provided in different specifications at industry leading price. We have established ourselves as trustful firm of premium grade 2" Inch CPVC Pipe. We bring forth the most reliable range of pipes that is ideal for plumbing applications in homes, apartments, hotels and high and low rise buildings. Developed from industry compliant grades of poly vinyl chloride compounds these pipes feature superior fire safety and remarkable resistance to chlorine present in water. Further, we are developing the industry compliant range with varied wall thickness specifications and pressure ratings.